“I think we might work a deal, and if we don’t, we might go that route," says Pres Trump of declaring a national emergency to get border wall built without Congress. Insists it's his “absolute right” as president to declare an emergency, though he didn't mention it in his speech. 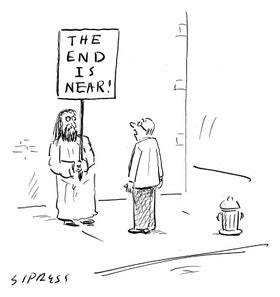 If you're this old (points at self), you remember the cartoon meme (before we had "memes") of the ragged street prophet carrying a sign with the message "The End is Near!" It was so stock it became a cliche and then, as "the end" became a serious matter, it disappeared. Anyway, Trump is still, IMHO, likely to end this situation by the squid ink approach of declaring himself King with the "absolute right" to get the wall built. Problem is, he has to cite a specific statute giving him the authority to divert military funds, direct the military to go to work, and abrogate the 5th Amendment (no, I'm not letting go of that), and there isn't one. The squid ink is that all that attempt would do would be to throw the matter immediately into the courts, allow Trump to declare victory and end the shutdown (win-win! ), and cancel this farce. The downside is, it doesn't make Trump any more of an administrator than he was before (it is "The Administration" for a reason), and it will probably appall any number of GOP Senators facing re-election (including John Cornyn, who as a border state Senator is notably silent, and looking at Ted Cruz's near loss knows he could be next, especially if eminent domain is the fuel for the fire). Of course, Trump is not going to govern for the next two years anyway (no more than he did the last two), so either way, the End Is Near.